This article is about the cartoon character. For other uses, see Felix the Cat (disambiguation). Felix's origins remain disputed. Australian cartoonist/film entrepreneur Pat Sullivan, owner of the Felix character, claimed during his lifetime to be its creator. American animator Otto Messmer, Sullivan's lead animator, has also been credited as such. 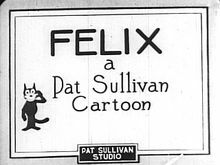 What is certain is that Felix emerged from Sullivan's studio, and cartoons featuring the character enjoyed success and popularity in the popular culture. Aside from the animated shorts, Felix starred in a comic strip (drawn by Sullivan, Messmer and later Joe Oriolo) beginning in 1923, and his image soon adorned merchandise such as ceramics, toys and postcards. Several manufacturers made stuffed Felix toys. Jazz bands such as Paul Whiteman's played songs about him (1923's "Felix Kept On Walking" and others). By the late 1920s, with the arrival of sound cartoons, Felix's success was fading. The new Disney shorts of Mickey Mouse made the silent offerings of Sullivan and Messmer, who were then unwilling to move to sound production, seem outdated. 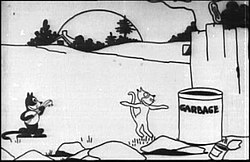 In 1929, Sullivan decided to make the transition and began distributing Felix sound cartoons through Copley Pictures. The sound Felix shorts proved to be a failure and the operation ended in 1932. 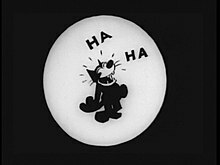 Felix saw a brief three-cartoon resurrection in 1936 by the Van Beuren Studios. Felix cartoons began airing on American TV in 1953. Joe Oriolo introduced a redesigned, "long-legged" Felix, added new characters, and gave Felix a "Magic Bag of Tricks" that could assume an infinite variety of shapes at Felix's behest. The cat has since starred in other television programs and in two feature films. As of the 2010s, Felix is featured on a variety of merchandise from clothing to toys. Joe's son Don later assumed creative control of Felix. In 2002, TV Guide ranked Felix the Cat number 28 on its "50 Greatest Cartoon Characters of All Time" list. In 2014, the rights to the character belonged to Joe Oriolo's son Don Oriolo. They were acquired by DreamWorks Animation, which is now part of Comcast's NBCUniversal division. On November 9, 1919, Master Tom, a prototype of Felix, debuted in a Paramount Pictures short entitled Feline Follies. Produced by the New York City-based animation studio owned by Pat Sullivan, the cartoon was directed by cartoonist and animator Otto Messmer. 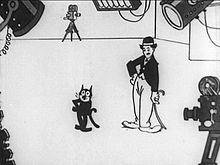 It was a success, and the Sullivan studio quickly set to work on producing another film featuring Master Tom, the Felix the Cat prototype in Musical Mews (released November 16, 1919). It too proved to be successful with audiences. Otto Messmer claimed that John King of Paramount Magazine suggested the name "Felix", after the Latin words felis (cat) and felix (happy). The name was first used for the third film starring the character, The Adventures of Felix (released on December 14, 1919). Pat Sullivan claimed he named Felix after Australia Felix from Australian history and literature. In 1924, animator Bill Nolan redesigned the character, making him both rounder and cuter. Felix's new looks, coupled with Messmer's character animation, brought Felix to gain a higher profile. The question of who created Felix remains a matter of dispute. Sullivan stated in numerous newspaper interviews that he created Felix and did the key drawings for the character. On a visit to Australia in 1925, Sullivan told The Argus newspaper that "[t]he idea was given to me by the sight of a cat which my wife brought to the studio one day". On other occasions, he claimed that Felix had been inspired by Rudyard Kipling's "The Cat that Walked by Himself" or by his wife's love for strays. 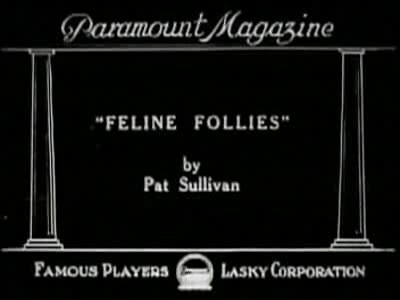 Members of the Australian Cartoonist Association have claimed that lettering used in Feline Follies matches Sullivan's handwriting and that Sullivan lettered within his drawings. In addition in the cartoon 'Feline Follies' at roughly the 4:00 mark of the cartoon the words 'Lo Mum' are used in a speech bubble by one of the kittens. A term for mother not used by Americans but certainly by Australians. Yet Messmer claimed to have singlehandly drawn Feline Follies from home raising questions as to why Messmer, an American would use the term 'Mum' in a cartoon he solely drew himself. Sullivan's supporters also say the case is supported by his March 18, 1917, release of a cartoon short entitled The Tail of Thomas Kat more than two years prior to Feline Follies. Both an Australian ABC-TV documentary screened in 2004 and the curators of an exhibition at the State Library of New South Wales in 2005 suggested that Thomas Kat was a prototype or precursor of Felix. However, few details of Thomas have survived. His fur color has not been definitively established, and the surviving copyright synopsis for the short suggests significant differences between Thomas and the later Felix. For example, whereas the later Felix magically transforms his tail into tools and other objects, Thomas is a non-anthropomorphized cat who loses his tail in a fight with a rooster, never to recover it. Sullivan was the studio proprietor and—as is the case with almost all film entrepreneurs—he owned the copyright to any creative work by his employees. In common with many animators at the time, Messmer was not credited. After Sullivan's death in 1933, his estate in Australia took ownership of the character. Animation historians back Messmer's claims. Among them are Michael Barrier, Jerry Beck, Colin and Timothy Cowles, Donald Crafton, David Gerstein, Milt Gray, Mark Kausler, Leonard Maltin, and Charles Solomon. No animation historians outside of Australia have argued on behalf of Sullivan. Sullivan marketed the cat relentlessly while Messmer continued to produce a prodigious volume of Felix cartoons. Messmer did the animation directly on white paper with inkers tracing the drawings directly. The animators drew backgrounds onto pieces of celluloid, which were then laid atop the drawings to be photographed. Any perspective work had to be animated by hand, as the studio cameras were unable to perform pans or trucks. References to alcoholism and Prohibition were also commonplace in many of the Felix shorts, particularly Felix Finds Out (1924), Whys and Other Whys (1927), and Felix Woos Whoopee (1930), to name a few. In Felix Dopes It Out (1924), Felix tries to help his hobo friend who is plagued with a red nose. By the end of the short, the cat finds the cure for the condition: "Keep drinking, and it'll turn blue". In addition, the cat was one of the first images ever broadcast by television when RCA chose a Felix doll for a 1928 NBC experiment in New York's Van Cortlandt Park. The papier-mâché (later Bakelite) doll was chosen for its tonal contrast and its ability to withstand the intense lights needed. It was placed on a rotating phonograph turntable and photographed for approximately two hours each day; as a result, Felix is considered by some to be the world's first TV star. After a one-time payoff to Sullivan, the doll remained on the turntable for nearly a decade as RCA fine-tuned the picture's definition. Felix's cartoons were also popular among critics. They have been cited as imaginative examples of surrealism in filmmaking. Felix has been said to represent a child's sense of wonder, creating the fantastic when it is not there, and taking it in stride when it is. His famous pace—hands behind his back, head down, deep in thought—became a trademark that has been analyzed by critics around the world. Felix's expressive tail, which could be a shovel one moment, an exclamation mark or pencil the next, serves to emphasize that anything can happen in his world. Aldous Huxley wrote that the Felix shorts proved that "[w]hat the cinema can do better than literature or the spoken drama is to be fantastic". In 1928, Educational ceased releasing the Felix cartoons, and several were reissued by First National Pictures. Copley Pictures distributed them from 1929 to 1930. There was a brief three-cartoon resurrection in 1936 by the Van Beuren Studios (Felix the Cat and the Goose That Laid the Golden Egg, Neptune Nonsense, and Bold King Cole). Sullivan did most of the marketing for the character in the 1920s. In these Van Beuren Studios shorts, Felix spoke and sang in a high-pitched, childlike voice provided by Walter Tetley, a popular radio actor in the 1930s and 1940s ("Julius" on The Phil Harris-Alice Faye Show, and "Leroy" on The Great Gildersleeve, but best known later in the 1960s as the voice of Sherman on The Rocky and Bullwinkle Show's Mister Peabody segments. 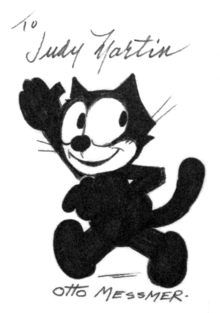 Given the character's unprecedented popularity and the fact that his name was partially derived from the Latin word for "happy", some rather notable individuals and organizations adopted Felix as a mascot. The first of these was a Los Angeles Chevrolet dealer and friend of Pat Sullivan named Winslow B. Felix, who first opened his showroom in 1921. The three-sided neon sign of Felix Chevrolet, with its giant, smiling images of the character, is today one of LA's better-known landmarks, standing watch over both Figueroa Street and the Harbor Freeway. Others who adopted Felix included the 1922 New York Yankees and pilot and actress Ruth Elder, who took a Felix doll with her in an attempt to become the first woman to duplicate Charles Lindbergh's transatlantic crossing to Paris. This popularity persisted. 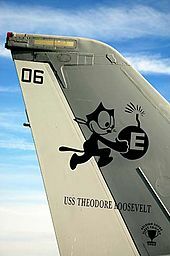 In the late 1920s, the U.S. Navy's Bombing Squadron Two (VB-2B) adopted a unit insignia consisting of Felix happily carrying a bomb with a burning fuse. They retained the insignia through the 1930s, when they became a fighter squadron under the designations VF-6B and, later, VF-3, whose members Edward O'Hare and John Thach became famous naval aviators in World War II. After the world war a U.S. Navy fighter squadron currently designated VFA-31 replaced its winged meat-cleaver logo with the same insignia after the original Felix squadron had been disbanded. The carrier-based night-fighter squadron, nicknamed the "Tomcatters", remained active under various designations continuing to the present day, and Felix still appears on both the squadron's cloth jacket patches and aircraft, carrying his bomb with its fuse burning. Nearly a century after his first debut on screen in 1919, he still makes occasional appearances in pop culture. The pop punk band The Queers also use Felix as a mascot, often drawn to reflect punk sensibilities and attributes such as scowling, smoking, or playing the guitar. Felix adorns the covers of both the Surf Goddess EP and the Move Back Home album. Felix also appears in the music video for the single "Don't Back Down". Besides appearing on the covers and liner notes of various albums, the iconic cat also appears in merchandise such as T-shirts and buttons. (In an interview with bassist B-Face, he asserts that Lookout! Records is responsible for the use of Felix as a mascot.) Felix has cameos in the 1988 film Who Framed Roger Rabbit  and (as a giant puppet) at the 2015 Treefort Music Fest. An ink drawing of Felix by Otto Messmer dating from around 1975. Messmer himself pursued the Sunday Felix comic strips until their discontinuance in 1943, when he began eleven years of writing and drawing Felix comic books for Dell Comics that were released every other month. Jack Mendelsohn was the ghostwriter of the Felix strip from 1948 to 1952. In 1954, Messmer retired from the Felix daily newspaper strips, and his assistant Joe Oriolo (the creator of Casper the Friendly Ghost) took over. The strip concluded in 1966. Felix co-starred with Betty Boop in the Betty Boop and Felix comic strip (1984–1987). With the advent of synchronized sound in The Jazz Singer in 1927, Educational Pictures, who distributed the Felix shorts at the time, urged Pat Sullivan to make the leap to "talkie" cartoons, but Sullivan refused. Further disputes led to a break between Educational and Sullivan. Only after competing studios released the first synchronized-sound animated films, such as Fleischer's My Old Kentucky Home, Van Beuren's Dinner Time and Disney's Steamboat Willie, did Sullivan see the possibilities of sound. He managed to secure a contract with First National Pictures in 1928. However, for reasons unknown, this did not last, so Sullivan sought out Jacques Kopfstein and Copley Pictures to distribute his new sound Felix cartoons. On 16 October 1929, an advertisement appeared in Film Daily with Felix announcing, Jolson-like, "You ain't heard nothin' yet!" Unfortunately, Felix's transition to sound was not a smooth one. Sullivan did not carefully prepare for Felix's transition to sound and added sound effects into the sound cartoons as a post-animation process. The results were disastrous. More than ever, it seemed as though Disney's mouse was drawing audiences away from Sullivan's silent star. Not even entries such as the Fleischer-style off-beat Felix Woos Whoopee (1931) or the Silly Symphony-esque April Maze (both 1930) could regain the franchise's audience. Kopfstein finally canceled Sullivan's contract. Subsequently, he announced plans to start a new studio in California, but such ideas never materialized. Things went from bad to worse when Sullivan's wife, Marjorie, died in March 1932. After this, Sullivan completely fell apart. He slumped into an alcoholic depression, his health rapidly declined, and his memory began to fade. He could not even cash checks to Messmer because his signature was reduced to a mere scribble. He died in 1933. Messmer recalled, "He left everything a mess, no books, no nothing. So when he died the place had to close down, at the height of popularity, when everybody, RKO and all of them, for years they tried to get hold of Felix... I didn't have that permission [to continue the character] 'cause I didn't have legal ownership of it". In 1935, Amadee J. Van Beuren of the Van Beuren Studios called Messmer and asked him if he could return Felix to the screen. Van Beuren even stated that Messmer would be provided with a full staff and all of the necessary utilities. However, Messmer declined his offer and instead recommended Burt Gillett, a former Sullivan staffer who was now heading the Van Beuren staff. So, in 1936, Van Beuren obtained approval from Sullivan's brother to license Felix to his studio with the intention of producing new shorts both in color and with sound. With Gillett at the helm, now with a heavy Disney influence, he did away with Felix's established personality, rendering him a stock funny-animal character of the type popular in the day. The new shorts were unsuccessful, and after only three outings Van Beuren discontinued the series, leaving a fourth in the storyboard stages. In 1953, Official Films purchased the Sullivan–Messmer shorts, added soundtracks to them, and distributed them to the home movie and television markets. Otto Messmer's assistant Joe Oriolo, who had taken over the Felix comic strip, struck a deal with Felix's new owner, Pat Sullivan's nephew, to begin a new series of Felix cartoons on television. Oriolo went on to star Felix in 260 television cartoons produced by Famous Studios which was renamed to Paramount Cartoon Studios, and distributed by Trans-Lux beginning in 1958. Like the Van Beuren studio before, Oriolo gave Felix a more domesticated and pedestrian personality geared more toward children and introduced now-familiar elements such as Felix's Magic Bag of Tricks, a satchel that could assume the shape and characteristics of anything Felix wanted. The show did away with Felix's previous supporting cast and introduced many new characters, all of which were performed by voice actor Jack Mercer. Oriolo's plots revolve around the unsuccessful attempts of the antagonists to steal Felix's Magic Bag, though in an unusual twist, these antagonists are occasionally depicted as Felix's friends as well. The cartoons proved popular, but critics have dismissed them as paling in comparison to the earlier Sullivan–Messmer works, especially since Oriolo aimed the cartoons at children. Limited animation (required due to budgetary restraints) and simplistic storylines did nothing to diminish the series' popularity. In 1970, Oriolo gained complete control of the Felix character and continues to promote the character to this day. In the late 1980s, after his father's death, Don Oriolo teamed up with European animators to work on the character's first feature film, Felix the Cat: The Movie. In the film, Felix visits an alternate reality along with the Professor and Poindexter. New World Pictures planned a 1987 Thanksgiving release for U.S. theaters, which did not happen; the movie went direct-to-video in August 1991. In 1994, Felix appeared on television again, to replace the popular Fido Dido bumpers on CBS, and then one year later in the series The Twisted Tales of Felix the Cat. Baby Felix followed in 2000 for the Japanese market, and also the direct-to-video Felix the Cat Saves Christmas. Oriolo has also brought about a new wave of Felix merchandising, including Wendy's Kids Meal toys and a video game for the Nintendo Entertainment System. According to Don Oriolo's Felix the Cat blog, as of September 2008 there were plans in development for a new television series. 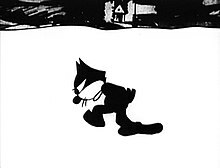 Oriolo's biography page also mentions a 52-episode cartoon series then in the works titled The Felix the Cat Show, which was slated to use computer graphics. DVD releases include Presenting Felix the Cat from Bosko Video; Felix! from Lumivision; Felix the Cat: The Collector's Edition from Delta Entertainment; and Before Mickey from Inkwell Images Ink. Some of the TV series cartoons (from 1958 to 1959) were released on DVD by Classic Media. Some of the 1990s series has also been released. When television was in the experimental stages in 1928, the very first image to ever be seen was a toy Felix the Cat mounted to a revolving phonograph turntable. It remained on screen for hours while engineers used it as a test pattern. Felix was voted in 2004 among the 100 Greatest Cartoons in a poll conducted by the British television channel Channel 4, ranking at No. 89. This page is based on the Wikipedia article Felix the Cat; it is used under the Creative Commons Attribution-ShareAlike 3.0 Unported License (CC-BY-SA). You may redistribute it, verbatim or modified, providing that you comply with the terms of the CC-BY-SA.